Susanna Pfisterer was born in Jasper, Alberta. After graduating from the University of Alberta and the University of Calgary, she travelled the world with the International Red Cross, working in Romania, Kenya, Rwanda, Puerto Rico and Kosovo on various humanitarian projects. Pfisterer returned to Jasper in 2004 to raise her family. She shares her late father's love of outdoor activities of all kinds, enjoying hiking, mountain climbing, swimming, canoeing, and skiing. 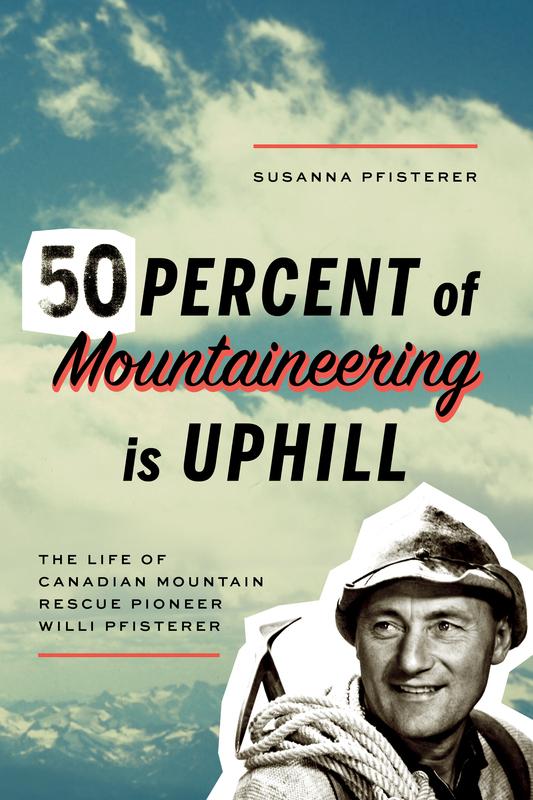 Fifty Percent of Mountaineering is Uphill is her first book. Friends William, Robert, and Annie are on the cusp of adulthood while the world is on the brink of war. It is a Canadian summer in 1939 and Robert and Annie's love has blossomed, even as the inevitability of the boys joining up means separation and the first of many losses. Fearing he might not return, Robert makes William promise to take care of Annie. Every arena of their lives is infiltrated by the war, from the home front to the underground of queer London to the bloody battlefields of Italy. Even in the aftermath, in the shadow of The Dreamland, these friends fight their own inner battles: to have faith in their right to love and be loved, to honour their promises and ultimately find their way "home." Laurel Deedrick-Mayne was born and raised in Lacombe, Alberta but has spent her adult life as a city dweller and now makes Edmonton her home. Once an arts administrator (dance publicist, concert promoter and ad copywriter) Laurel has become a juggler: raising a family, managing her private massage therapy practice, serving on multiple arts boards ... and writing. This book is a tribute to the generation of her parents, grandparents, aunts, and uncles who took the time to hang on to family letters, clippings, stories, and poetry — all those treasures that inspired this story. A Wake For The Dreamland is Laurel’s first novel. For ten year-old Jeremiah Prins, the life of privilege as the son of a school headmaster in the Dutch East Indies comes crashing to a halt in 1942 after the Japanese Imperialist invasion of the Southeast Pacific. Jeremiah takes on the responsibility of caring for his younger siblings when his father and older stepbrothers are separated from the rest of the family, and he is surprised by what life in the camp reveals about a woman he barely knows-his frail, troubled mother. Amidst starvation, brutality, sacrifice and generosity, Jeremiah draws on all of his courage and cunning to fill the gap for his mother. Life in the camps is made more tolerable as Jeremiah's boyhood infatuation with his close friend Laura deepens into a friendship from which they both draw strength. When the darkest sides of humanity threaten to overwhelm Jeremiah and Laura, they reach for God's light and grace, shining through his people. Time and war will test their fortitude and the only thing that will bring them safely to the other side is the most enduring bond of all. Whether writing youth or adult fiction, Sigmund Brouwer is a best-selling author of more than 40 fast-paced novels. He loves going to schools to get kids excited about reading, reaching roughly 80,000 students a year through his Rock & Roll Literacy Show. Sigmund is married to songwriter recording artist Cindy Morgan. The couple and their two young daughters divide their time between Red Deer, Alberta and Nashville, Tennessee. Following his mother's death in 2004, Tyler Trafford discovers an album of old letters and creased photographs that reveal a mother he never knew, a man he's never heard of, and a love affair doomed by class and circumstance. The letters are from Jens Müller, a Norwegian pilot who trained in Canada during the early days of World War II, one of only three prisoners who would make it home after The Great Escape. In Almost a Great Escape, Trafford takes us on a journey of emotional discovery and dramatic disclosure as he reconstructs his mother's life, from her youth as a wealthy Montreal debutante to her final days as a broken but unbent casualty of a loveless marriage. His search for answers takes him across Canada and then across the ocean to Norway, hoping to learn more about the mystery of this secret relationship. Written with a fluidity fueled by heart-wrenching honesty, Trafford's unconventional memoir confirms that while you can survive your past, you can never escape from it. Almost a Great Escape includes photographs as well as excerpts and reproductions of telegrams and letters Jens sent from England and Stalag Luft III. Rebee Shore's life is fragmented. She's forever on the move, ricocheting around Alberta, guided less than capably by her dysfunctional mother Elizabeth. The Shore Girl follows Rebee from her toddler to her teen years as she grapples with her mother's fears and addictions, and her own desire for a normal life. Through a series of narrators-family, friends, teachers, strangers, and Rebee herself-her family's dark past, and the core of her mother's despair, are slowly revealed. The Shore Girl is a mosaic of Rebee: of her origins, of her past and present; from darkness and grief, to understanding and hope for a brighter future. Fran Kimmel was born and raised in Calgary. After graduating from the University of Calgary with a degree in Sociology, she worked an eclectic mix of jobs including youth worker, career counsellor, proposal writer, and a ten-year stint as a VP for a career consulting firm. Fran's stories have appeared in literary journals across Canada and have twice been nominated for the Jurney Prize. Fran currently lives in Lacombe with her husband and overly enthusiastic silver lab. This is her first novel. Leo Desroches goes straight - off the streets, into the newsroom, and up to his neck in murder. Making the debut of Leo Desroches, one of the most unusual amateur detectives ever to appear in Canada or points south, this fast-paced, enthralling mystery is the story of a man who had everything, lost it all, and is trying to get it back. Leo Desroches doesn't look like a native, but his mother was Cree, and he understands the problems of indigenous Canadians of the First Nations...which is probably why the Edmonton newspaper he writes for decides he should be their Aboriginal Issues reporter. He has his own issues to deal with: his compulsive gambling that he couldn't stop even after it cost him his wife and children; his alcoholism; the risk-taking that threatens to derail him every time he starts to get his life back together. When he's assigned to cover the murder of a young native prostitute, it's just one more story...until the cop in charge lets him view the corpse, something the Edmonton police never do. When Leo writes his article, it starts a chain of evens that leads him to discover a much, much bigger story, one that could bring down the entire police department...if it doesn't get him killed. Wayne Arthurson is an aboriginal writer/musician who lives in Edmonton. He is the author of four history books, two novels, and countless magazine articles. On March 15, 1939, Helen Waldstein's father snatched his stamped exit visa from a distracted clerk to escape from Prague with his wife and child. As the Nazis closed in on a war-torn Czechoslovakia, only letters from their extended family could reach Canada through the barriers of conflict. The Waldstein family received these letters as they made their lives on a southern Ontario farm, where they learned to be Canadian and forget their Jewish roots. Helen Waldstein read these letters as an adult-this changed everything. 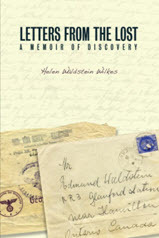 As her past refused to keep silent, Helen followed the trail of the letters back to Europe, where she discovered living witnesses who could attest to the letters' contents. She has here interwoven their stories and her own into a compelling narrative of suffering, survivor guilt, and overcoming intergenerational obstacles when a traumatic past. Since receiving her Ph.D in French Literature, Helen Waldstein Wilkes spent 30 years teaching at every level in Canada and int he U.S. Her research interests include cross-cultural understanding, language acquisition, and neurolinguistics. Now retired and living in Vancouver, she is actively examining her own cultural inheritance and its impact. My name's Bacon Sobelowski, and I'm trying to find my someone. Kenny Rogers sings a song that says there's someone for everyone, and int Bellevue where I live, Kenny Rogers' word is gold. It's just too bad my mother thinks girls turn boys into pigs, but that's probably just because my father had enough of her Eggos and walked out. But maybe she's right. I'm not sure if Sarah is my someone because she got mad and smashed chili peppers into a cut on my head, and maybe my someone wouldn't do that. Karla could be it because she lets me stay at her condo, but she might be too old to be my someone. Then there's Mr. Kwon's daughter, but she's sort of my cousin and I'm not sure if sort-of cousins can be someones at the same time. I think it might come down to timing, and it that's true then I'm in trouble. I'm Bacon Sobelowski - who knows if I'll ever find my someone. While Michael Davie has lived in South Korea, it was his years spent in the Rocky Mountain towns of Waterton, Banff, Canmore, and Jasper, living immersed in an often eccentric resort subculture, that most influenced his creative output, first in publishing a cartoon series, The Last Resort, then in literature with his first novel, Fishing for Bacon. Davie, who is originally from Lethbridge, graduated from the University of Lethbridge with a Bachelor of Management and studied Creative Writing at the University of Calgary and the Victoria School of Writing. He and his family now live in Victoria, BC.